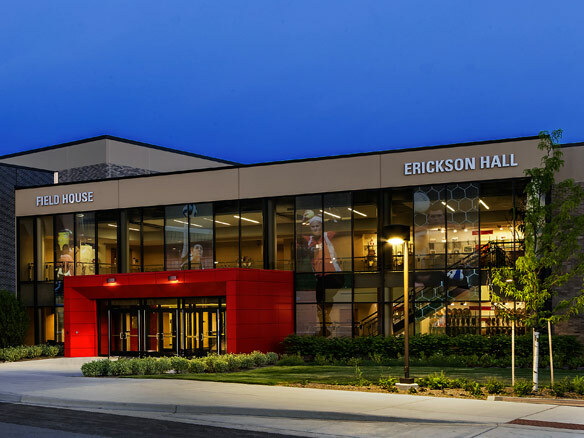 Waubonsee Community College opened the doors of its new Field House addition and renovated Erickson Hall in March on the college's Sugar Grove campus, marking completion of its 2020 College Master Plan. Supporters including public officials, faculty, and friends, gathered to reflect on the projects completed through the years and tour the capstone project, the new field house. "More than just buildings, we've created greater access to education and more opportunities for student success," said Dr. Christine Sobek, who as President of Waubonsee Community College has shepherded the improvements during the past 14 years. "And we've seen results - the number of our degree and certificate completers has increased by 43 percent over the last six years." In the early 2000's, Waubonsee Community College adopted a grand, forward-thinking plan for its future with the anticipation of a population and enrollment growth within Waubonsee's boundaries. The plan included the addition of seven new buildings between the four campuses as well as multiple infrastructure and renovation projects. Cordogan Clark & Associates provided master planning and architectural services for Waubonsee Community College and assisted in the development of the 2020 College Master Plan. Located on the Sugar Grove campus of Waubonsee Community College, the new 59,000 square foot Field House and 55,000 square foot Erickson Hall renovation provides training, practice, and competition space to support Waubonsee's athletics program, including credit and noncredit physical education and wellness instruction. The complex offers a seamless, first-class facility that will make it easier for multiple teams to practice and also serves as a recruiting tool. "This building is more than just a place to play or work out," Dr. Sobek told the hundreds of students, staff and other community members who gathered to see the building. "It will also help us foster pride, develop our students as well-rounded individuals and contribute to the quality of life for our community." "The same teamwork that brought the 2020 College Master Plan buildings to life will be reflected inside the walls of our new Field House and renovated Erickson Hall, as the college's 13 teams and individual athletes practice, train and compete here," Dr. Sobek said. "They look to carry on the Chiefs' winning tradition, which now spans almost half-a-century." Cordogan Clark & Associates were the architects for the new Aurora Campus and new Field House and renovated Erickson Hall; Turner Construction provided construction management services for both projects.